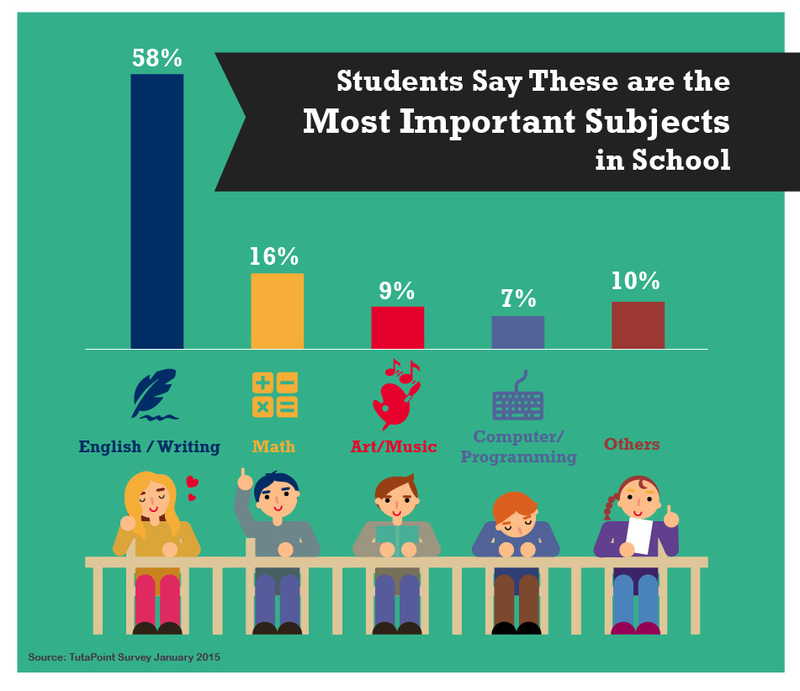 A recent survey conducted by New York based TutaPoint Education determined how students perceive the importance of writing skills. The January 2015 survey reached out to middle and high school students with 14 questions regarding their use and goals regarding language arts and writing skills. A review of the methodology used for this survey can be reviewed here. First, students were asked: Which subject area below covers topics you use MOST in every day life. Overwhelmingly, 58% of students indicated that language arts and writing skills are most important. A distant second was math at 16%. Rounding out the list were art and music at 9%, computer programming at 7%, science at 6.5%, and history at 3%. Students are also using technology to communicate: 45.9% of students indicated that they would communicate a short message via text message. Based on this, it shouldn’t be a surprise that more than a third of students report sending 26 or more text messages per day; 11.6% reported sending over 100 messages per day. Use of correct grammar and spelling is important on college and job applications, indicate students. A college application with an error on it will likely lead to a negative admittance decision, indicated 90% of students. An error on a job application will hurt your chances of landing the position, said 85%. But students report that errors are prevalent. Friends posting on social media are the worst offenders, as 87.3% of respondents report seeing spelling and grammatical errors in their friends writing. With just a small improvement, 76% of students indicate seeing errors in their parents’ or other adults’ writing. Better, but not great: 54.5% of students surveyed indicate seeing spelling and grammar errors in their teachers’ writing. Students overwhelmingly agree, with 90% agreeing, that developing strong writing skills will help them to become more successful adults. TutaPoint Education supports students with math, science and language arts and recently launched its new Writing Advancement Lab. The lab, which is available to students online, allows students the ability to quickly submit their writing for review and critique by an experienced writing instructor. For more on TutaPoint’s writing center click here.